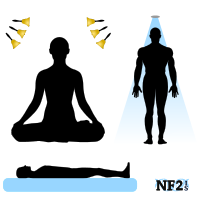 There are many methods of meditation that can result in relaxation of the whole body. While often seen as a person sitting on a floor, or in a chair, the best can be standing with no shoes on in the middle of a room or a shower, or laying flat on a comfortable surface. Eyes should be closed so environment does not cause a distraction, relax brow, jaw, unclench hands, focus on breathing until heartbeat can be felt without the need of hand on chest. Once you can find your heartbeat, take a deep breath in and breath out. Allow next breath to be a normal but slow steady breath in, but when breathing out do so with a two heart beat count longer than breathing in, while maintaining relaxed muscles in the body. Repeat for several minutes as needed. Some find it helpful to say a calming prayer can help with this, which can have better results when said together in groups, examples of Hail Mary, or Serenity Prayer. Meditation in the shower can help the feeling of stress fullness pushed out and away. Sitting with a lit candle, can by looking and trying to learn a pattern to the flame. Meditation methods shared are a share of things I learned and use to help manage some of my tinnitus, headaches, blood pressure and to end insomnia. I did these things many years before I knew it lowered blood pressure having been tested for blood pressure with a high number, laying down method of meditation was used and blood pressure was checked again approximately twenty minutes later. Biofeedback/Neurofeedback uses in the doctor's office with similar methods but includes sensors to monitor change to help a person see how well they do and what may work better.